Westerville, OH, March 14, 2017 – The Woda Group, Inc. is pleased to announce Willoughbeach Terrace has earned LEED Gold Certification from the US Green Building Council (USGBC). Willoughbeach Terrace is a new 50-unit affordable senior community located on the waterfront of Lake Erie in Willowick, OH, about 17 miles northwest of Cleveland. 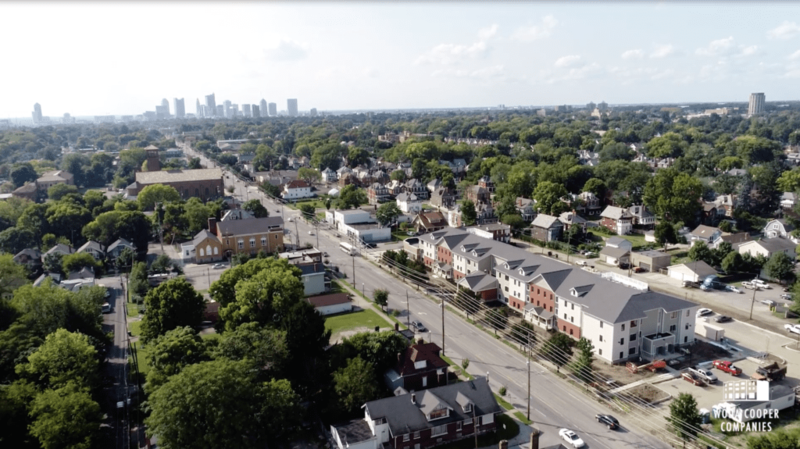 The new community is the result of collaboration between Woda and Cleveland’s Catholic Charities Housing Corporation. The LEED Gold designation serves as a strong signal of the environmental friendly design features and construction methods used to develop Willoughbeach Terrace, and the favorable expected energy savings to maintain it. LEED (Leadership in Energy and Environmental Design) is undoubtedly the most recognized third-party verification and designation for the design, construction, maintenance and operations of green buildings, homes and communities. Willoughbeach Terrace offers one- and two-bedroom units in a modern three-story elevator building with many amenities including off-street parking, fitness center, recreation room, library and access to public transportation. In addition, the building features a third floor sunroom facing the lakefront and a gazebo on the bluff also overlooking the lake. Apartment units rent for $520 to $620 per month and are now available. They are carpeted, air conditioned and equipped with energy saving appliances including dishwashers. In addition, all units allow for wheelchair access. Catholic Charities Housing Corporation assisted Woda in developing a plan for onsite services geared for seniors. These services, coordinated by Catholic Charities’ affiliate Community Service Lake County, include items such as transportation, meal delivery, planned social activities and connections with area agencies serving seniors. St. Mary Magdalene, a Catholic church in Willowick, was also an early supporter and catalyst for the development, said McCabe. Willoughbeach Terrace is part of an ongoing housing-specific redevelopment initiative within the City of Willowick. The area’s Lake Shore Boulevard Corridor is a mixed-use neighborhood of over 100 retail shops, services and restaurants. Before Willoughbeach Terrace was established, the popular, vibrant area offered no affordable housing options for Willowick seniors on fixed incomes. Funding for Willoughbeach Terrace was provided through tax credits allocated by the Ohio Housing Finance Agency (OHFA). Key Community Development Corporation purchased those credits in exchange for equity. OHFA ‘s Housing Development Loan program supplied a $3 million bridge. Other construction and permanent loans were provided through KeyBank Community Development Lending and RiverHills Bank. The new development reflects the successful collaboration between Woda, a leading commercial firm in affordable housing design, construction and management, and an energized nonprofit Catholic Charities Housing Corporation, with strong local community support, to produce a desirable and much-needed housing option for the City of Willowick’s seniors. “We appreciate the tremendous team effort to support the needs of the seniors of Willowick and the development of Willoughbeach Terrace,” McCabe said. For a short aerial tour of Willoughbeach Terrace, visit http://bit.ly/2njOrI3.